Klipsch RF-7 II. Illustration courtesy of Klipsch Group, Inc. 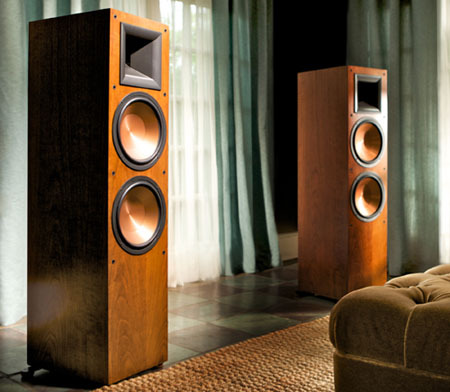 This is a list of home entertainment loudspeaker manufacturers, past and present, that at one time or another have built good (Class A or Class B) loudspeakers. Some, like Bozak and Dynaco, are gone (*). Other companies, like AR and Altec-Lansing, are out of the component loudspeaker business, but still offer other consumer products (*). Still others, like Pioneer, market a few loudspeakers, but the main thrust of their business has moved to other fields. Then there are those, like Klipsch, Quad, JBL and B&W, that are still leaders in the loudspeaker field in which they have been a force for decades. Loudspeakers, particularly those from the top manufacturers that use high quality drivers (such as Klipsch and Altec-Lansing) are very well made and durable goods, so there is an active used market for used speakers. Buying used is a way to get higher quality loudspeakers that you could afford to buy new and good loudspeaker systems last for decades. Beware of old speaker systems using drivers with foam surrounds, however, as these can deteriorate over time. There are a great many loudspeaker manufacturers in the home entertainment market and most are small companies that are not exactly household names and with which I have had no experience. The list that follows includes only brands that I know at least something about, either first hand, through audiophile friends and reviewers, or by reputation. They are at least recognized in the audiophile community. This list is not exhaustive; there are many other good speaker brands (and some very poor ones) that are not on this list. If I have left out your favorite, it doesn't mean it's no good, only that I am not familiar with it.